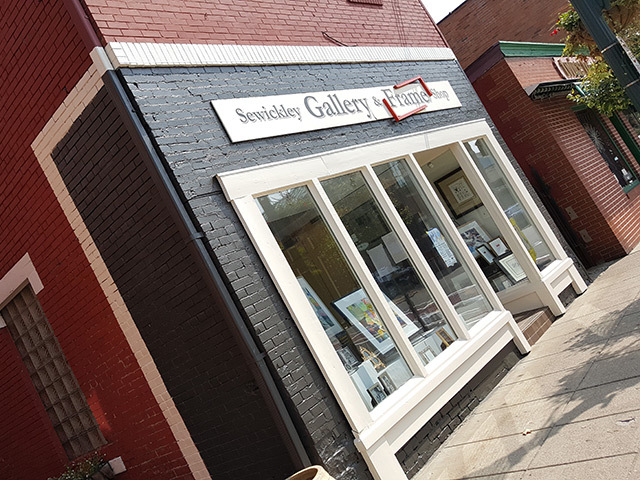 Welcome to The Sewickley Gallery & Frame Shop, located in the charming village of Sewickley just minutes from Pittsburgh. We are committed to providing each and every client with creative, personal, and valuable solutions to their framing and decorating needs. We offer expert and original custom framing performed on the premises. We will be delighted to assist you while choosing the proper frame, making sure that the final choice will enhance your art piece and fit the environment in which the art will be displayed. We invite you to visit us and discover our large selection of samples. Within our framing studio, we only use state-of-the-art archival materials and framing procedures. The Sewickley Frame Shop was founded in 1985 and in 2000 the name was changed to Sewickley Gallery & Frame Shop under the current management.